Saw this idea on Sugar Bee Crafts and had to try it out. It was very easy to do and I linked it with Length in Maths. It can be done in whatever colours you like – we choose green and orange. The children really enjoyed making them! Children choose 3 different sizes (7 inch, 9 inch and 11 inch). You need 2 of each size. They line them up – small, medium, large, large, medium, small. Pick up the pieces in this order and line them up at one end. Staple together. Put the stapled end close to you. Take the 2 pieces of paper which are the same and join the together (in a heart shape, continue with next size and then the final size and staple together. Tutorial here (making hearts). 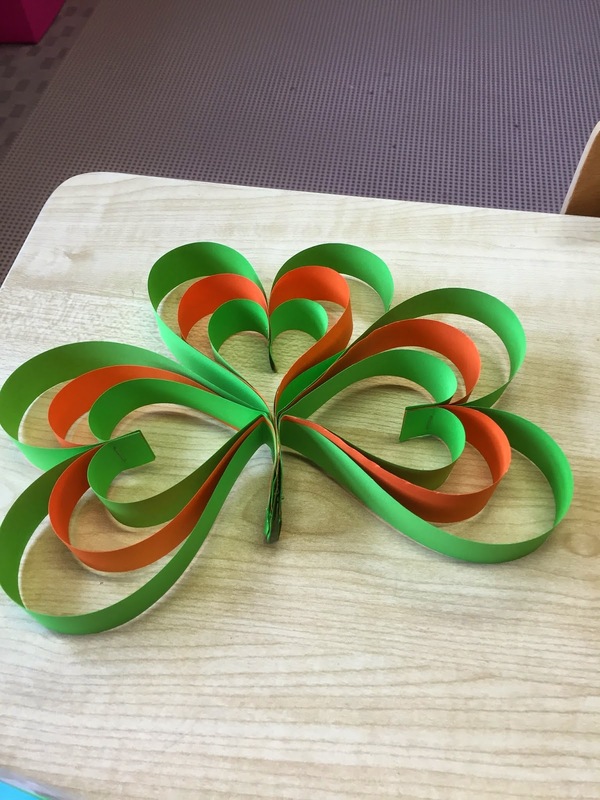 Make 3 and staple together to form the shamrock!